When I applied months ago to be a part of Google’s Explorer program for their wearable Glass, I didn’t think I’d hear back anytime soon. I assumed that they would be selecting from a pool consisting primarily of developers and media folk who would give some positive early previews of the device to feed into the hype continues to build for the platform. That being said, I was pleasantly surprised when I received an invitation email a few days ago from Google that I now had my chance to become a Glass Explorer myself. After trying unsuccessfully to wipe the grin on my face that was my initial reaction to reading this, I clicked the link titled “Get Glass” and started to reflect about my current situation: Is this new wearable smartphone accessory really worth the $1500 price tag? My biggest concern with jumping the gun and shelling out over a grand for a cell phone accessory isn’t whether I’d actually use it or not. While some Explorers have mentioned that wearing Glass in public can be a bit strange and awkward, I’d relish in the attention and would enjoy explaining the contraption on my face to onlookers. Rather, I am worried that becoming an Explorer and paying for an unfinished version of the product will come back to haunt me upon Google’s official release of Glass. How much will it cost? When will is be released? How much MORE will I have paid to get it earlier than others? While I am leaning more toward declining the offer to pay to be a part of the program, I am curious to see what others have to think. If you were in my shoes, would you take a chance to try out Glass up to a year before others? Or would you ride it out and wait for the public release to (hopefully) nab it at a much lower price point in the near future? 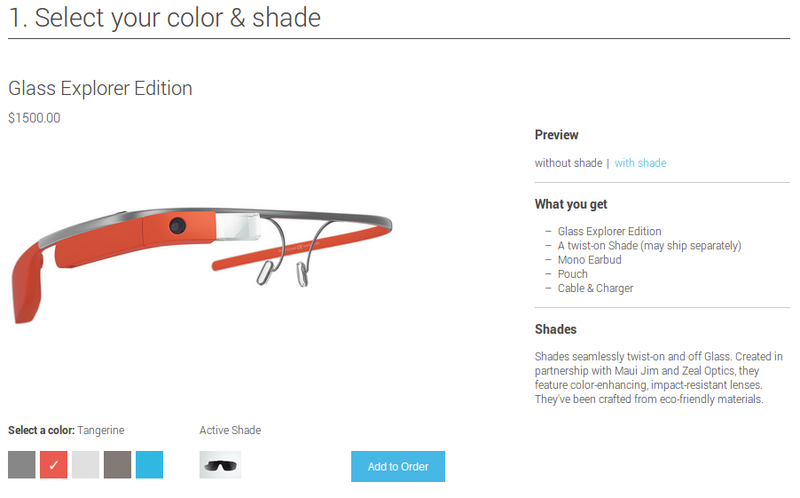 Having the chance to own Google Glass (even with the high price tag) is tempting – but is it worth it? When I initially received the invite, only the Tangerine and Sky colors were available for purchase. After checking again today, however, I’ve noticed that their other color options are now in stock (I’ve had my eye on Cotton from the beginning) which makes me reconsider giving it a go. Leave a comment below or tweet @EdTechToolkit with your opinion, as I’m having a hard time convincing myself to make the transition to Glass right now.